Green leaps off the cap and barrel of this 1945 Parker Vacumatic Major like living electricity in "The Matrix." We've restored it with a new diaphragm and wet sanding that gives it glassy, factory-fresh finish. There's still a little light wear visible, and the imprint is a bit faded on the right side. This pen has a slightly harder to find two-band cap band. There's a little brassing. The most noteworthy damage are rings around the section grip, and a couple of "comb teeth" missing from the inkfeed below the nib. The original 14k gold nib writes a nice, wet medium line. 12.6cm capped. Parker VP fountain pens led the way for many new innovations for Parker in the 1960s. Only made for a couple years, these vintage pens introduced the adjustable nib that would be much more famous on the Parker 75, which replaced this pen in the line-up. It also experimented with the converter fill system. Although the pen says you can remove the aerometric-style converter, we highly recommend against it. The clear glass/plastic viewing window at its base is very fragile. Light wear afflicts the pen, but it isn't too bad for a daily user. No dents but the cap might look a little scratched up to some. The 14k gold nib writes a very nice extra-fine line. Its cap closes all the way, but it doesn't take a lot of effort to slip it back off. 13.7cm capped. Hip, hip, hooray! The class of 1942 celebrated in style with this first-year 1941 Parker 51! Well, partly first year 51. Marketing material for the grand release of the Parker 51 in 1941 said that the pen was 10 years ahead of its time, which is why it was called the 51. Only first-year pens were given the aluminum tail jewel in the blind cap. Although the imprint seems to have worn off, the "Class of '42" engraving seems to be a nice verification of age. We are a little perplexed that the pen looks more teal blue than cedar blue, as would be appropriate. The sterling silver cap, which is in great condition, is a later model replacement cap. It still has a blue-diamond clip, but the jewel is plastic grey pearl--not aluminum. This vintage pen's diaphragm has been replaced, and it is in good working order. The 14k gold nib writes a smooth fine line. Light wear can be found in all the usual places. No cracks or dents. 13.8cm capped. Before they notice anything else, Parker Vacumatic (Major) hounds will jump on the fact this pen has a rarer "stacked coins" cap band. Golden Pearl stripes make up for some of the scratches. They also partially conceal the engraved "Edward McAuliffe" in gold letters. Its date code states it was made in 1945. We restored the vacumatic filler with a new diaphragm. No cracks blemish this pen. The clip is on tightly, and the blue diamond indicated the pen was guaranteed for the life of the original owner. Barrel clarity is poor but still possible at the right angle for light to pass through. Click the headline for a close-up of the original 14k gold nib. It writes an extra-fine to fine line with a hint of vibration but not bad at all for such a nib. 12.8cm capped. 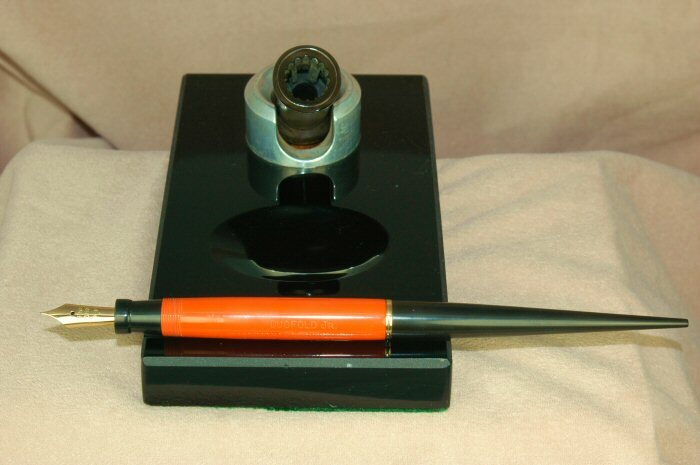 We think this is quite possibly one of the prototypes for the Parker Duofold Jr. desk pen made c. 1925 or '26. We cannot guarantee it, but the aluminum swivel holder is the main clue, as Parker never mass produced it. It is not marked, and it was most likely custom machined. The hard rubber version of it went into production in 1926. The hard-rubber Parker Duofold Jr. desk pen is in great condition. The imprint is practically perfect, except for fading out on the very far right side. The ink feed is a "Christmas Tree." The 14k nib writes a fine-medium line. The tail is in perfect condition, and there is no brassing on its gold ring. The gold button shows no brassing. The pen base has no chips or cracks that we can see. The felt on the bottom was replaced. The pen holder is a chocolatey brown but in good working order. The spring underneath it still pushes back. This pen has been fully restored and works wonderfully. The pen measures 19cm, and the base measures 15cm X 9cm X 2cm. So revolutionary, it was considered 10 years ahead of its time when it was released in 1941...hence it was called the Parker 51. Using Vacumatic technology and a hooded nib, this pen held more ink than just about any pen in its day, and it was far less likely to dry out. Our Parker 51 is from the mid- to late '40s. We restored its Vacumatic filler with a new diaphragm. The blue diamond on its clip meant that it had a warranty for the lifetime of its original owner. Its gold-filled cap has a couple shallow dimples and is in good overall condition. The dove grey pen shows more wear, including some obvious scratches and scars on the nib hood or cowling. The 14k gold nib writes an extra-fine line with a little feedback. 13.6cm capped. Another rare modern Parker Duofold International fountain pen graces our preowned luxury pens pages. This is the early jade green that almost mimics the discoloration of the earliest jade Duofolds in the 1920s. Unlike those, this has layers in the green with white and black flecks and a subtle glitter spread through the entire cap and barrel. Near mint condition with the exception of two really thin lines of wear on the backs of the cap bands where/when the pen rested on its side. Complete with a Parker converter. The two-tone 18k gold nib is marked medium and writes closer to a smooth, wet fine. The word Duofold is in a banner on the top cap button and on the nib. 13.1cm capped.